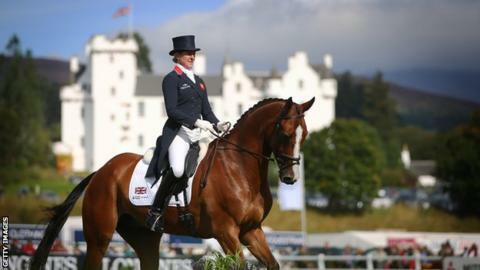 Blair Castle was not only a spectacular backdrop to the 2015 FEI European Eventing Championship, it was also home to 300 volunteers across the four day event. As with all major sporting events, the Championship could not have happened without people willing to give their time for free. From answering spectator questions to driving the athletes across the site, the team of helpers made sure the event ran smoothly for everyone involved. We talked to four volunteers who were part of the team and found out why they signed up for the job, and if they would do it all again. Jo Bigger caught the volunteering bug at the London 2012 Olympics. The 44-year-old from Suffolk, worked in the mixed zone in Greenwich. At Blair Castle, Jo manned the information stand and acted as the first port of call for visitors and riders. "I really enjoy being involved with top level events; I love seeing what goes on behind the scenes, watch the horses being led out to have a pick of grass and the stable management side of things. "In my day to day work I help young people get into employment. I talk to them about my volunteering experiences and try and encourage them to get involved. I tell them to think about what interests them - it might be horses or it might be helping in their local library. "Volunteering is a fantastic way to meet people and grow your skill set." Vicki Cookson, from Lancashire, stumbled on the idea of volunteering while searching for information on attending the event. A keen equestrian enthusiast, Vicki feels like this is an opportunity to give something back to the sport she loves. "As I had some time off work I thought we would come to the FEI European Eventing Championship 2015 at Blair Castle in Scotland. When I went on the website to have a look I found the link to volunteering and here I am! It was the first time I had volunteered at an event and I would definitely do it again. "My role was in the Support Team which was great. I filled in the gaps, from allocating t-shirts to other volunteers, to pole picking in the showjumping and setting up the course for the working hunter classes. "For me volunteering is giving back to sport, it was loads of fun and I met so many people. "You feel like you are part of a big friendly team, everyone mucks in and it was a very positive experience." Living a short distance away in Ayrshire, Ruth Murdoch is no stranger to Blair Castle. In the past Ruth has competed at the grounds so volunteering for the championship seemed a natural thing to do. "I have competed here in the past and now my daughter, Lucy, is competing. We are very proud and excited for her. "I was a driver to the athletes. It was great to meet all of the riders! "I love being part of it and you get up close and personal. As a volunteer you get to see other things that other people do not see. "We had a good time and we met lots of lovely people"
Working as both a Games Maker at the London 2012 Olympics and as a Clyde-sider at the 2014 Commonwealth Games in Glasgow, Gina Martlew is no stranger to volunteering at major events. "My original inspiration was my mum who went to the Rome Olympics and I promised her if the Olympics ever came to the UK I would volunteer. I then inspired my ex-sister-in-law Salli Martlew (pictured above with Gina) to volunteer. "[At Blair Castle] I was a Zone steward stopping the public going into restricted zones, checking passes and watching out for problems as they arose and feeding back to the relevant people. "It was good fun, friendly, helpful and it was good to meet the riders and see behind the scenes of the competition." Fancy volunteering for a major sports event or local club? Sign up to the #BigHelpOut and be one of the 10,000 people using their skills to help their community. Find out more.